The Tibetan ethnic group is one of the oldest in China. The people have their own written and oral language, and believe in Tibetan Buddhism. The Tibetans mainly live in Southwest China's Tibetan Autonomous Region with the rest forming Tibetan communities in neighboring Qinghai, Gansu, Sichuan, and Yunnan provinces. The Tibetans have produced vast collections of first class achievements in astronomy, medicine, literature, drama, painting, sculpture, and architecture. According to historical records, the Tibetans inhabited the Qingzang Plateau as early as 5,000 years ago. In the 7th century AD, the Tibetan king, Songtsan Gampo, unified the whole region and established the Tubo Dynasty (629-846). The marriage of this Tibetan king to Princess Wencheng from Chang'an (modern-day Xian, the then capital of the Tang Dynasty (618-907)) and Princess Chizun from Nepal helped to introduce Buddhism and develop Tibetan culture. Since its introduction to Tibet in the 7th century, Buddhism has developed unto a unique form in the area. Tibetan Buddhism, blended with Tibetan history and culture, has extended into every area of Tibetan life. Among the vast collections of the religious works and scriptures, the two most famous are Kanjur and Danjur. Yaks, known as the "Boat of the Plateau," are essential to the life of the Tibetans. They are the major source of meat and milk, and they also serve as the means of transportation because of their tolerance of cold in the snowy mountains. Zamba -- made from roasted highland barley mixed with butter, sugar and tea -- is a staple food for the Tibetans against the harsh weather. The Tibetans wear various kinds of costumes made of silk, sheep's skin, wool, and cotton. Men's costumes are bold and loose, while women's are elegant and graceful. A man's robe is usually longer than his height; therefore, when he wears it, he has to lift the gown and tie it with a waistband, leaving the gown's bottom 30 to 40 centimeters above his feet. Women wear jewelry, mostly gold and silver. The sleeves of their shirts are usually longer than their arms and are used as a feature in Tibetan dances. Tibetans' grand monasteries represent their high architectural level. The Potala Palace in Lhasa is an outstanding example of Tibetan architecture following the style of traditional Tibetan houses, neat and orderly in appearance, practical for protection against wind and cold. The art of the Tibetan religion has its own unique forms seen in Thangka,mural painting, and sculpture. Thangka is a kind of scroll painting drawn on cotton rolls. The stories shown are usually religious. Butter sculpture, which originated several hundred years ago, is a unique Tibetan art. During the Lantern Festival every year, butter sculptures, based on historical and religious stories and made by the Tibetan Lamas, go on display. The brightness in colors and vivid lifelikefigures and flowers amaze many visitors. Tibetan medicine has a history of more than 3,000 years. According to historical records, the first Tibetan king of the Tubo Dynasty already had his personal doctor. Incorporating elements of medical theory and practice from the Han (of the Tang Dynasty) and Indian peoples, Tibetan medicine developed into its own system. The famous doctor Yutog Yondan Gonbo wrote his masterpiece "Four Volumes of the Tibetan Medicine" in the 7th century. The book, a summary of his experience in different places and countries, including China, India, and Nepal, is of great value even now. The important festivals of the Tibetans include Tibetan New Year, the Buddha Demonstrating Day, the Sagadawa Festival, the Horserace Gathering and Bathing Festival, and so on. Recent policy changes have stimulated economic growth in the Tibetan areas, and people's ideas are changing. 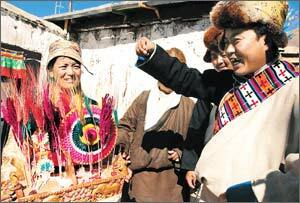 Tibetans are coming down from the mountains to participate in joint-venture business schemes and exchange programs. They are making their own contribution to the whole of China.